Pictured (l-r) are MAT candidates Hayward Johnson and Nicole McIntyre, COE faculty Heather Scott, Ed.D. and Lacey Huffling, Ph.D., and MAT candidates Oliva Coumes and Britt Gantt. College of Education (COE) Master of Arts in Teaching (MAT) candidates shared classroom research and experiences during two recent conferences. 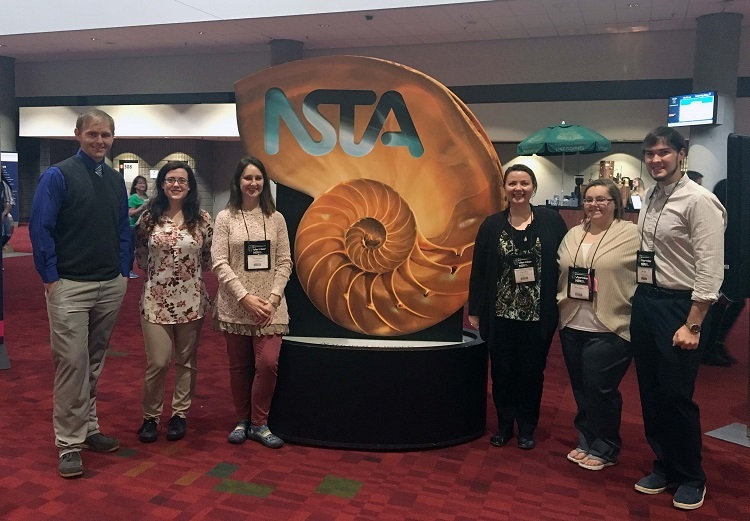 At the National Science Teachers Association (NSTA) 2018 Conference, held March 15-18 in Atlanta, Georgia, MAT Secondary Education, biology concentration students Hayward Johnson, Nicole McIntyre and Britt Gantt and chemistry concentration student Olivia Coumes presented alongside COE faculty members Lacey Huffling, Ph.D. and Heather Scott, Ed.D. The presentation, titled “Ecological Considerations: Providing Access for All Students,” discussed how to highlight research of diverse field ecologist, develop inquiry tasks with animal photographs and the creation differentiated performance tasks for middle school students. It was the graduate students’ first experience presenting at a national conference. 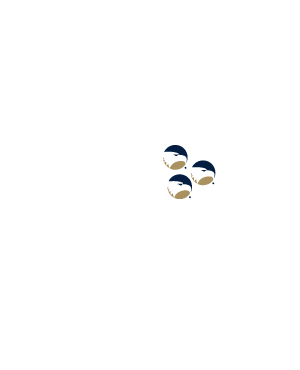 McIntyre added that the experience was “empowering” and that she formed many connections, attributing the opportunity back to Georgia Southern University. Regina Collins, MAT Middle Grades Education, math/science concentrations candidate, attended the NTSA conference as well. Presenting at the STEM Teaching and Learning Conference were Britt Gantt (left) and Kristin Lecomte. 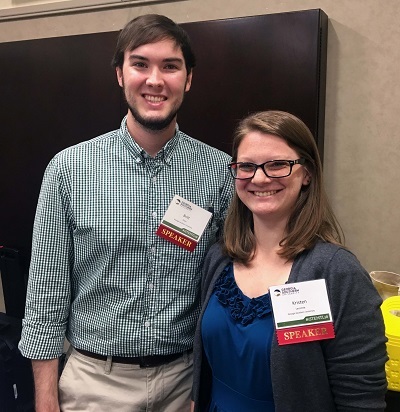 Additionally, MAT candidates participated in the March STEM Teaching and Learning conference held in Savannah, Georgia. Gantt presented with MAT Secondary Education, biology concentration candidate Kristin Lecomte. “Looking for Resources for Your Science Classroom?” allowed the science teachers to share information about the work they have completed to redesign life science kits provided by the University’s Project Sense to provide more hands-on, inquiry lessons. Fellow MAT Secondary Education candidate Zachary Weaver who is studying a concentration in biology, also contributed to the presentation materials. Project Sense, a University initiative since 1989, provides K-12 classroom teaching kits for earth, life and physical sciences. The students also provided information about this project and how it can best support teachers.